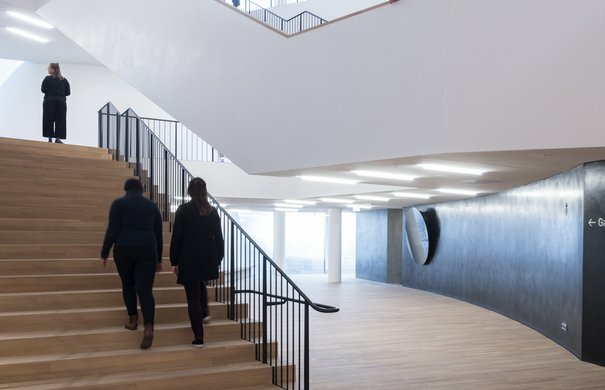 Through the old Kaispeicher warehouse, over the Plaza and into the Grand Hall: Elbphilharmonie guided tours offer visitors an exciting opportunity to explore the unique architecture of Hamburg’s concert hall on the River Elbe. A concert visit is the best means of exploring and getting to know the Elbphilharmonie’s unique concert halls, spectacular foyers and outstanding acoustics. We offer guided tours through the Elbphilharmonie for guests that wish to visit without attending a concert. Our guided tours of the Elbphilharmonie building take you through the old Kaispeicher warehouse, the Plaza, the foyer areas and the heart of the Elbphilharmonie, the Grand Hall. 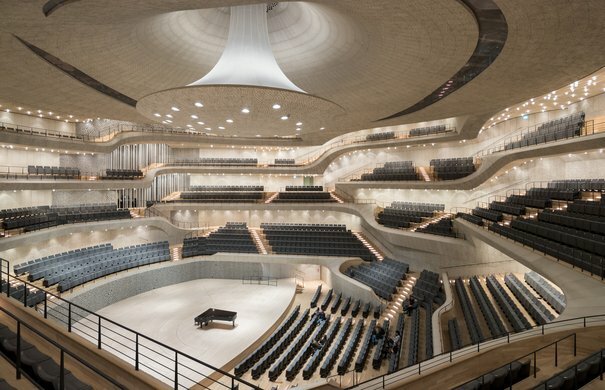 In addition to exciting stories about the beginnings of the Elbphilharmonie and details about the architecture of the new Hamburg landmark, we also provide information on the operation of the concert hall and its music programming. 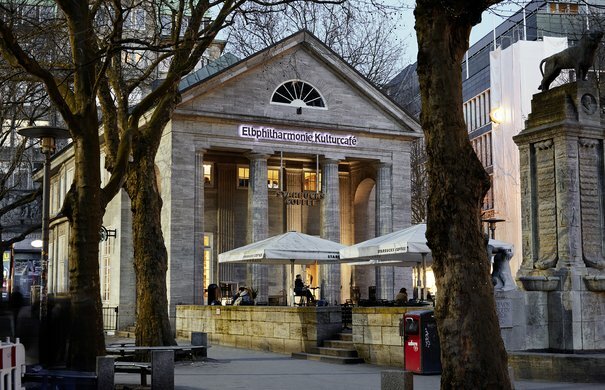 All tours start from the Elbphilharmonie Visitor Center opposite the Elbphilharmonie (Am Kaiserkai 62). Please arrive at the Visitor Center 15 minutes before the start of the tour. Late arrivals (later than start time) may not participate, and are not entitled to a replacement tour or a refund of the purchase price. Our guided tours are physically demanding. This is due, in particular, to the staircases extending over many floors in the Grand Hall foyer that must be climbed by foot. Guided tours are planned in accordance with the concert and rehearsal schedule of the concert hall. Guided tours for individuals are available to book online or in person at the Elbphilharmonie ticket shops (not by email). Guided group tours can only be booked online. Tickets are generally not available earlier than 12 weeks before the date of the guided tour. No guided tours will take place at the Elbphilharmonie between 8 July and 4 August 2019. Assistants or companions of disabled visitors (with a »B« disability pass) may take part in tours free of charge, however a ticket is still required. 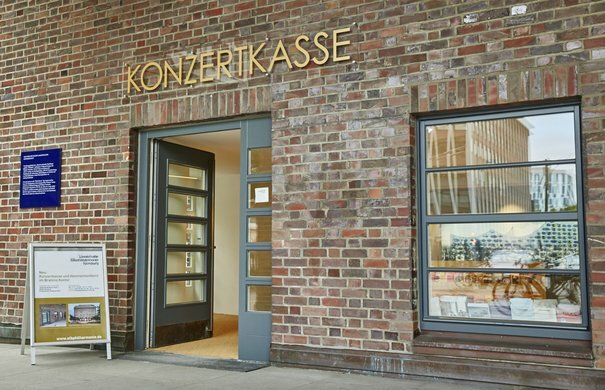 Tickets for accompanying persons can be collected in person from the Elbphilharmonie ticket offices. Tickets for individuals are available online as print@home tickets or to download onto your smartphone. A maximum of five tickets may be purchased at any one time. Payment is accepted via PayPal, SOFORT Online Bank Transfer, Amazon Pay or with credit card (MasterCard or VISA). Bookings are final: tickets cannot be exchanged or refunded. Tickets for individuals may also be purchased in person at the Elbphilharmonie ticket shops (not by email). Payment is accepted via PayPal, SOFORT Online Bank Transfer, Amazon Pay or with credit card (MasterCard or VISA). Bookings are final: tickets cannot be exchanged or refunded. Located on the ground floor of the Elbphilharmonie. 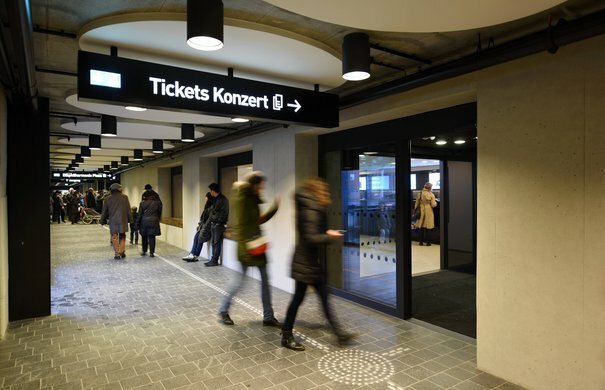 Please note: The ticket shop in the Elbphilharmonie closes at 18:30 on 17 January. The evening box office opens 90 minutes before the start of concert as usual. Located next to the fountain on Mönckebergstrasse. At what times do guided tours take place? Guided tours are planned in accordance with the concert and rehearsal schedule of the concert hall. Tours are offered at different times almost daily. The majority of guided tours take place between 09:15 and 16:00. Does the tour visit the Grand Hall? A vast majority of guided tours takes visitors into the Elbphilharmonie Grand Hall. In rare cases, the hall cannot be visited owing to its concert and rehearsal schedule. Will the Recital Hall also be viewed? The Recital Hall is a multipurpose space and continually hired out. Only in exceptional circumstances is the Recital Hall offered as part of a guided tour. Are there breaks during a guided tour? Tours do not include a toilet break. Are lifts used during regular guided tours? During a regular guided tour, a number of staircases – particularly in the Grand Hall foyer – must be climbed by foot. Some routes are shortened by the use of lifts. Guided tours end on the Plaza, where guests are welcome to remain and enjoy the view over the city and the port. A separate Plaza ticket is not necessary. Is photography permitted during tours? No audio recording, video recording or photography is allowed during guided tours. Is it possible to store suitcases or valuable items? Neither a cloakroom nor lockers for storing luggage are provided. Why aren't the tours suitable for children under 8 years of age? The guided tours are aimed at a more grown-up audience. Children are however welcome to participate. Are discounts available for children, senior citizens or unemployed persons? No, there are no discounts. Can the person accompanying a visitor with disabilities take part in a guided tour free of charge? Can tickets for guided tours be exchanged or refunded? No, bookings are final. Tickets for guided tours cannot be refunded or exchanged.